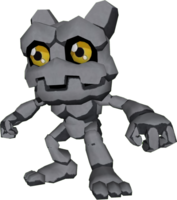 Clad in the ore data from within a field, it is an Ore Digimon with powerful defensive ability. 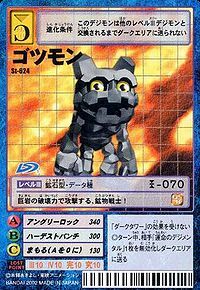 Due to its mischievious, cheerful personality, it brings low generation Digimon along with it as though it were a bully, and is a live wire who jumps about in the system. It is sometimes a bit selfish, and runs wild with violence like a volcanic eruption once it is angered, becoming uncontrollable. 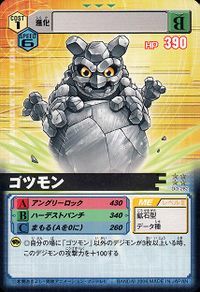 The ore data it expresses varies depending on the location and conditions of where it emerged, and it has the potential for various evolutions. 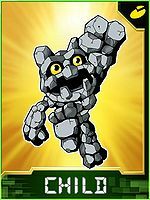 Its Special Move is shooting super-hard ore from the top of its head (Angry Rock). — Digimon Savers: "I Will Protect Chika! Piyomon`s Decision"
adj., From Gottsui 「ごっつい（ゴッツイ）」, alternatively spelled as gotsui 「ごつい（ゴツイ）」, both of which mean "rough; hard". 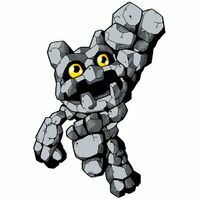 アングリーロック Angurī Rokku Rock Fist/Angry Rock Fires rocks from its head. Abarenbou  Madcap 暴れん坊 N/A Crazy Crusher/Wild Strike Swings its arms wildly at an enemy. Punches at the foe with a rock fist. 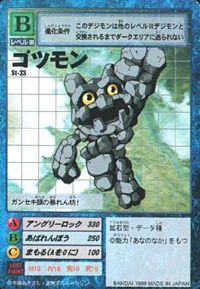 アースシェイカー Āsu Sheikā Earth Tremor/Earth Shaker Slams the ground with its fists, causing pillars of rock to erupt. Gottsumon along with Pumpmon were servant of Vamdemon. However, both were rather inept at the whole "evil minion" thing and primarily goofed off. As punishment, Vamdemon killed them both. A Gottsumon was the partner of an international chosen child, Chichos. 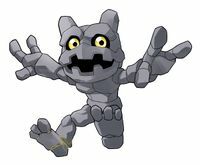 This Gottsumon could evolve into Monochromon. 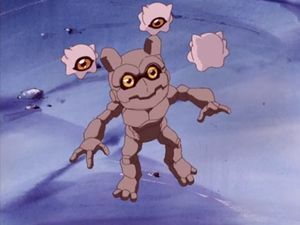 Gottsumon is one of Mercurymon's minions. 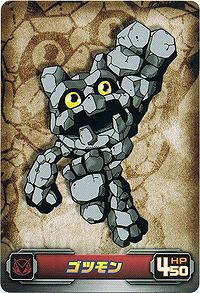 Gottsumon is an enemy digimon that can be found at Mt. Panorama. 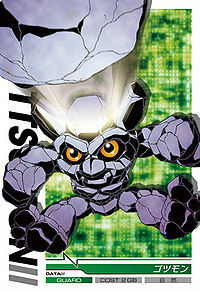 Gotsumon can be found wild at BIOS Domain, Modem Domain, SCSI Domain, and Core Tower. 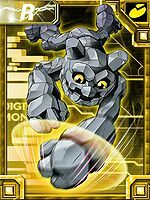 Can evolve to Icemon (0-2 DP), Tsuchidarumon (3-5 DP) or J Mojyamon (6+ DP). Can be found at Training Mountain. Can evolve to Airdramon if above level 11 and Dragon EXP above 100, Minotaurmon if above level 28, or Icemon if above level 35. It also gives you a request mission to obtain a Fancy Shirt from a boy named Masahiko, whose at the shop in DigiCentral. 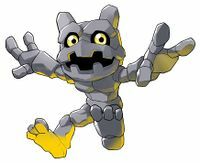 There are also two Gottsumon appear at Pucket Lagoon, who needs help to bring their homeland from the Gekomon and Tonosamagekomon. 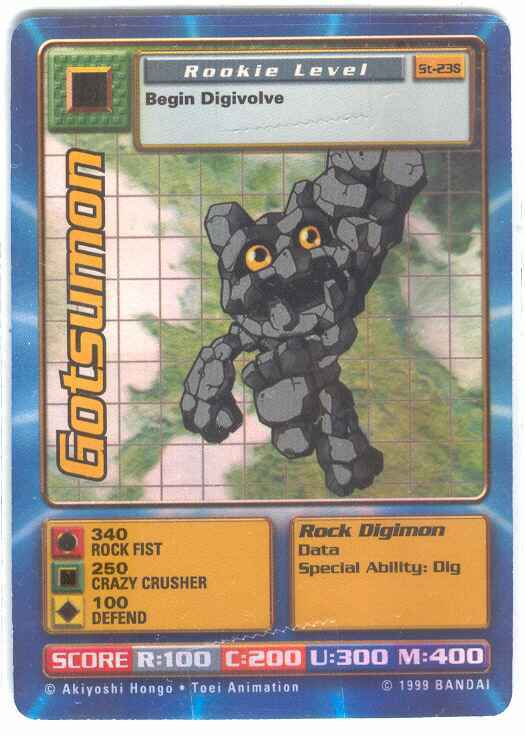 Gottsumon can evolve to Icemon or Golemon. In Chapter 1 avatar part 2 is protected by Piyomon, Gottsumon and Shakomon. Evolves from Mochimon. Can evolve to Tortamon, Monochromon, Starmon or Gekomon. Evolves from Mochimon. Can evolve to Tailmon, Monochromon, Starmon or Gekomon. 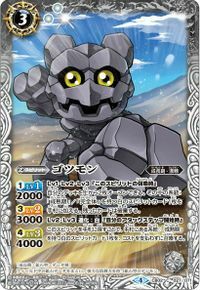 Evolves from Mochimon and can evolve to Monochromon, Starmon or Gekomon. 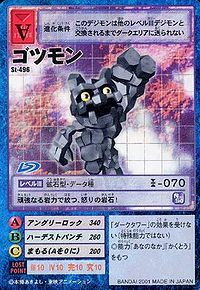 It attacks with super hard minerals! 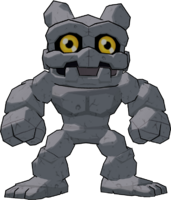 It fires out a rock of anger with its sturdy powers of stone! 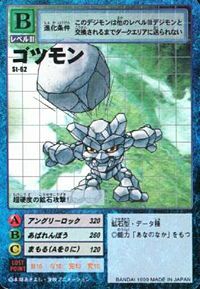 This mineral warrior attacks with the destructive power of boulders! A cheerful and mischievous Digimon that is full of energy. Its body is made up of hard ore that can have different qualities depending on where it was born and other factors, opening up to it endless possibilities of evolution. 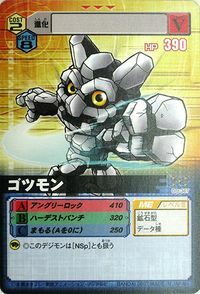 Clad in the ore data from within a field, it is an Ore Digimon with powerful defensive ability. ↑ Digimon Frontier: "Fight Together! Gottsumon and Kouji's Vow"
↑ Digimon Adventure 02: "Love and Borscht, The Fierce Fight!"